Want to play World of Warcraft: Battle for Azeroth? We have 500 codes for the beta! 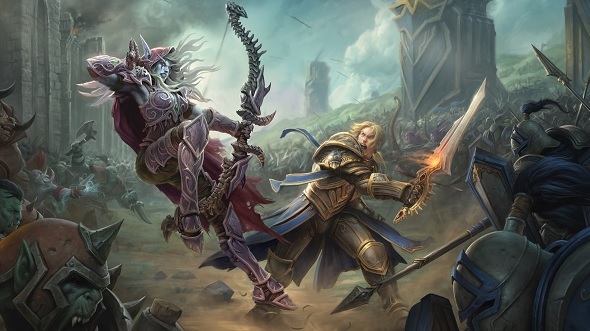 World of Warcraft’s next thrilling expansion, Battle for Azeroth, is set to reignite the conflict between Horde and Alliance this August. But you don’t have to wait until the end of the summer to check it out. Why not? Blizzard have sponsored us with 500 keys that grant access to the Battle for Azeroth beta. Obviously, that’s not enough for everyone, so if you want to win one you’re going to prove your worth. Get your best battle cry ready and sharpen your blades. If you don’t know, Battle for Azeroth will raise the level cap from 110 to 120 and bring a bunch of new dungeons and raids to World of Warcraft. It will also add new uncharted islands and the two continents Kul Tiras and Zandalar – along with four new allied races each for the Alliance and the Horde. Obviously, with a name like Battle for Azeroth, the expansion is all about getting stuck back into the age-old conflict between the two factions. To that end, there will be new warfronts added too, which will have 20 players team up against NPCs from the enemy faction to see who comes out on top. To keep with the spirit of the expansion, if you want to win one of the 500 beta keys we have for Battle for Azeroth you will need to tell us why your side – either the Horde or the Alliance – will win the upcoming conflict. But there’s a catch as you need to do it in haiku form. Death is their sure fate. If you’re unsure of what a syllable is then don’t fret, we’ll explain. A syllable is a single unbroken sound that forms part of a word. For example, the word ‘water’ has two syllables: ‘wa’ and ‘ter’ (pronounced war andter). Another example is the word ‘Alliance’, which has three syllables: ‘All’, ‘i’, and ‘ance’ (pronounced ‘ahl’, ‘eye’, ‘ans’). Got all that? Right then. To enter, you need to write your haiku, telling us why your side is going to win the battle for Azeroth, in the widget below. Make sure you follow the haiku format because if you don’t your entry will not be valid. Once you have entered you will be in with a chance of winning one of the 500 beta keys – these will be given out after the competition ends on May 21. Please also note that you will need to have a Battle.net account to redeem and activate your beta key. Pleaseread our terms and conditionsbefore you enter.